The Chinese Garden, lovingly designed, assembled, and cared for by the Sunset Park Garden Club, was the subject of destructive rage a short while ago. There is now no sign of what was once a ceramic pagoda, a bridge, and a swimming dragon. 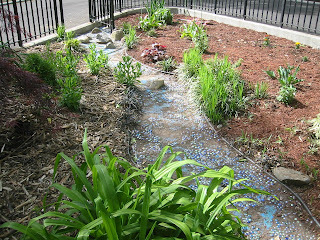 The sparkling stream (created with glass beads) still exists, but many of the beads have been extracted. Apparently, some person (or persons) who dislike all things Asian-inspired felt it necessary to use a large boulder within the Chinese Garden to smash the decorations to pieces over two or three days. The items had been bought with a grant given to the Club. Other difficulties the garden, which sits close to the 6th Avenue and 44th Street entrance, has experienced include plants stolen, a wonderful tree forcibly removed, and parents allowing children to romp about within the confines of the garden. The tall gate surrounding the garden makes it clear that the garden is for visual, not physical, enjoyment. The image of the Chinese Garden is its current, growing state. If you missed the decorative aspects, hopefully some of them will be replaced in the near future. 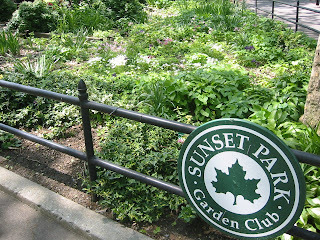 If you would like to join the Sunset Park Garden Club (no minimum time commitment needed! ), contact Naomi Alvarez at nealvarez@aol.com or at 718-851-0875. You can also call 718 965-6538 for more information. Sunset Park Garden Club's mission statement: To nurture, beautify, and maintain the diversity of our historic park and its peoples. I'll be linking back! Hopefully, more publicity will help. A call to the community for help in identifying and apprehending the vandals couldn't hurt. How recently did this occur? How many gardens are there within Sunset Park proper? It happened a few weeks ago. The members to whom I spoke suspected either teens or extremely disgruntled, angry residents. 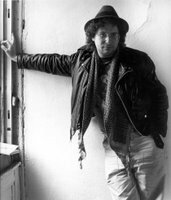 Who knows from where the misplaced anger stems. There are several gardens worked on by the Garden Club. The most planned are the Chinese Garden and the 41st Street/7th Ave Garden. There is also a Children's Garden, and several areas of growth that include bushes and mulch and various plantings. The park is also using some recent funds to work on some rose bushes and plant (and hopefully maintain) new trees. Stop by! Thanks very much for the link back; I appreciate it! Done: Sunset Park Garden Club Needs YOU! A locked gate and higher fence. Anything is gonna get smashed in any park regardless of location. Spring is here, kids are out. Get a higher fence. Anonymous makes two good suggestions for any area you want respected. There is actually a padlocked gate of just over four feet around the garden. I'm also of the naive attitude that people, even kids, should learn to respect areas meant for the enjoyment of others as well as themselves. The people who destroyed the Asian decorations would probably have done it regardless of an extra foot on the fence. It doesn't mean we should accept it as the way things should be.